Take a tour of the future Geffen Hall via this 3-D visual simulation, courtesy of UCLA Capital Programs. When the Los Angeles County Metropolitan Transportation Authority was grappling with massive debt and traffic gridlock in the 1990s, it was difficult to see what direction it should be moving in next. City officials, including then Los Angeles County Supervisor Zev Yaroslavsky, decided to visit Curitiba, a city in Brazil, to see an innovative network of express buses whisk passengers along dedicated lanes. They came away impressed. But what really won Yaroslavsky over to the idea of express buses was a video prepared by a group of techno-wizards from UCLA’s Department of Architecture and Urban Design. They had successfully married military flight simulation and virtual reality technology to create a groundbreaking, interactive urban planning tool. 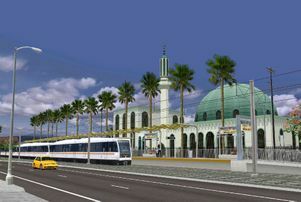 Using both bird’s-eye and pedestrian vantage points, the video showed how a “Metro Rapid” bus system would look on Wilshire Boulevard. A drawing taken from a simulation of the Expo Line that helped city planners visualize what it might look like. 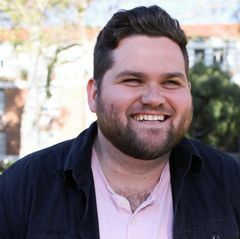 In 2013, the Urban Simulation Team that created that tool disbanded when funding from national and local sources dried up and its leader William Jepson retired. But the urban simulator lives on. It's now in the hands of David Sartoris, a senior architectural associate with UCLA’s Capital Programs design and construction team. Sartoris, who joined the Urban Simulation Team while an architecture student at UCLA, is the sole proprietor and manager of decades’ worth of interactive 3-D content developed by the team. 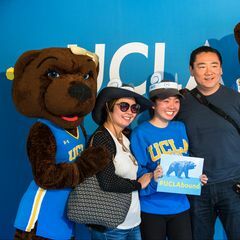 After the team broke up, Sartoris, who earned his master’s degree in architecture, moved the UCLA database to Capital Programs, which oversees the campus’s long-range development. He began collaborating with Campus Architect Jeffrey Averill. The tool has proven its worth many times. After the 1992 Rodney King riots, city agencies used the urban simulator to help with reconstruction of hard-hit areas such as Pico-Union. It was also used by city planners to simulate what new construction would look like in an area, how streets would look with different species of trees and what a redevelopment project might achieve for a neighborhood. Today, campus planners use the bird’s-eye and ground-level simulations to help project architects fit buildings into available spaces. “It gives us extra breadth as a design and visualization tool,” Averill says. 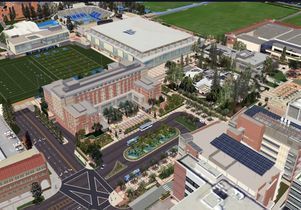 With land in short supply, much of the campus’s growth and development is happening next to or even atop existing buildings. One particularly complex job, completed in 2013, entailed construction of new residential halls and recreation facilities in one corner of the campus. For companies partnering with UCLA, the simulations can be a godsend. Years ago, the Urban Simulation Team took officials from Karl Storz Endoscopy-America, Inc. of El Segundo on a digital spin through the planned Ronald Reagan UCLA Medical Center. The experience helped steer their construction of operating rooms and installation of endoscopic video systems. To see simulations of what campus buildings now under construction will look like, go here. This piece was adapted from two stories running in UCLA Magazine’s April 2016 issue.